New York, NY : Greenwillow Books, an imprint of HarperCollins Publishers, . Toby and Luke are best friends, bound by a goal of leaving their hometown for Luke's wrestling scholarship, but a series of events during their senior year will test their resolve. Bliss, B. (2018). We'll fly away. First edition. New York, NY: Greenwillow Books, an imprint of HarperCollins Publishers. Bliss, Bryan. 2018. We'll Fly Away. New York, NY: Greenwillow Books, an imprint of HarperCollins Publishers. 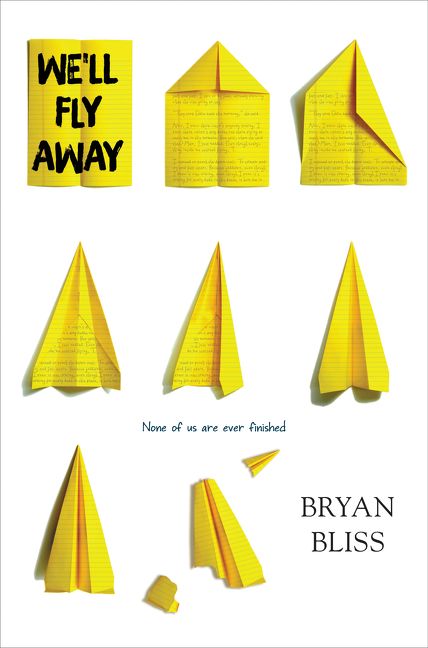 Bliss, Bryan, We'll Fly Away. New York, NY: Greenwillow Books, an imprint of HarperCollins Publishers, 2018. Bliss, Bryan. We'll Fly Away. First edition. New York, NY: Greenwillow Books, an imprint of HarperCollins Publishers, 2018. Print. |a Bliss, Bryan |e author. |a We'll fly away / |c Bryan Bliss. |a Toby and Luke are best friends, bound by a goal of leaving their hometown for Luke's wrestling scholarship, but a series of events during their senior year will test their resolve. |a Dysfunctional families |v Juvenile fiction. |a Choice (Psychology) |v Juvenile fiction. |a Death row |v Juvenile fiction. |a Death row |v Fiction.